De Bachmakov is the latest from the The Different Company. It celebrates artistic director Thierry de Baschmakoff’s Russian origins and the Année France-Russie; if you go to the dedicated website, you can read (or download) a sort of travelogue that explains some of the inspirations for the unisex fragrance. 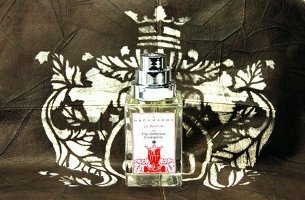 De Bachmakov was developed by perfumer Celine Ellena, and the notes include bergamot, shiso leaves, coriander leaves, freesia, jasmine, nutmeg, cedar and craie douce.1 It is supposed to evoke the winds of Asia and the sun hitting the forests of Siberia and buds pushing through the snow in the spring. De Bachmakov starts bright and zingy and cold. As Octavian has already noted at 1000 fragrances, it smells early on rather like green herbs and a twist of lemon over iced gin. The "craie douce" reads almost like a very dry and chalky iris to my nose, and it dominates the composition once the top notes have worn off: it slowly softens the bracingly cold notes of the opening, and over this background the sheer florals in the heart do nicely call up the idea of buds and green stems pushing up through snow. The dry down is slightly warmer, but only slightly. It's woody-musky and mildly spicy. The lasting power is excellent although it does wear softly (or I think it does — I have not tried it sprayed). De Bachmakov is my favorite fragrance from Celine Ellena so far, and the first thing from The Different Company that I've added to my "buy" list since Divine Bergamote launched in 2003. It smells unusual but not weirdly so, and more than that, it just smells great. I should think you could wear it in just about any weather, and I predict it will find many fans. The Different Company De Bachmakov is available in 90 ml (refillable) Eau de Parfum (145€); it is currently available at Bon Marché, The Different Company or Parfums & Co in Paris. Hopefully it will be in other sizes as well once it goes into wider distribution. “Craie douce” is an intellectual interpretation of the composition musk and cedar wood. Céline Ellena wanted to translate a powdery but not sweet “minéralité”, smooth, mat and as tender as chalk with this special scent when it is humid. It’s the wind scraping rocks and snow in that particular moment when spring takes over winter. In reality, craie douce is the association of macro-cyclique musks (the most eco-friendly) and woody notes composing the perfume. This sounds promising. Can’t wait to sniff. Thanks, Robin, this sounds glorious! My wallet wishes this didn’t sound enticing to me. Given all the little lemmings you’ve just set in motion, that shouldn’t be difficult. LOL…in that case maybe I really should have talked it up more, right? Seriously though, this is one of my favorites so far this year. I think remarks like “favorite so far” and “first to buy since 2003” make a rather favorable impression. I’m hoping for the little travel refills, too. This sounds lovely! Seems like it takes the 3×10 travel sets a little longer to be launched, unfortunately. I notice the TDC website has them for sale direct even for recent launches now, but a lot of the other retailers don’t have the most recent scents in travel size yet. Love those little things, even though $30+ per 10ml (if split amongst several people) is kind of pricey. Wow, looking forward to trying this one. I just bought 50 ml of Sel de Vetiver as a birthday present to myself. It’s lovely on hot, humid days, but a breath of Siberian spring sounds nice also. Will add that TDC has really, really nice packaging–bottles with so much heft they could be used as weapons of self-defense. And love the label on this one — I guess it’s silly to care about the label, but it does look nice. And as for the model, can’t think of anything more evocative of Siberia. When I was there, there were heaps of girls, just like her, wandering around in the forest wishing they’d worn more and hoping for spring to get a move on. All true — rather have a nice package than not, so long as I don’t have to pay big $ for it (as in By Kilian). Nice review Robin! This one sounds fantastic and highly unusual– in short, a definite must try! I think it’s fantastic, and interested to see more reviews of it. Robin, This sounds really interesting. It’s been almost 100 degress in past few days in NY, I would love a Siberian spring right about now!! This wore beautifully in the heat, and think it will work in cold weather too although obviously have no way to test that at the moment! Thanks for the review, R. This does sound interesting — I love when perfumers sort of tread new ground in the way they develop a scent, and this certainly sounds like it does. Not necessarily shocking or edgy, but something that’s not “the same old thing” in terms of development. I like TDC scents and consider Bois d’Iris and Osmanthus personal staples that I always want around (at least in travel size). Come to think of it, I also consider Rose Poivrée required sniffing for an understanding of interesting modern perfumery. Sublime Balkiss was nice, but I haven’t sampled it much. So yes, I like the TDC line and look forward to sampling De Bachmakov. Yes…this is not really what I’d call edgy, just really well done and different. I adore Divine Bergamote & Bois d’Iris, but those are the only 2 I adore so far. I do think many of the others are great scents, just don’t adore them. Sublime Balkiss in particular was fun, and we don’t get enough “fun” from niche. Oooh, thanks for the review. So far none of the TDC’s fragrances made a huge impression on me but this one does sound very appealing. There’s a stockist in my area too so hopefully they’ll have some testers soon enough! P.S. gosh, that’s one seriously skinny model. Thats not a real person. Someone just photoshopped a face on a feather duster. HA! I was going to say it looks like her hair weighs more than she does, but your comment is funnier. Have to agree with boojum – lots of lemmings set in motion today. It’s always fun though to wait for the first *bad* review, and then watch all those little lemmings die! Nah – I’m not going to read the negative ones, if there are any. I need a good reason to not buy this now. Because you might hate it! Sounds like a must-try for me! Thanks for the review, Robin — and thanks for including the info on craie douce, I’d been wondering about that! I was wondering too! I need to try this next to Dzongkha — was wondering today if they have a similar “cold stone” thing, and then realized it had been ages since I’d worn Dzongkha. I bet that would be an interesting comparison. I love Dzongkha (can never remember how to spell it though!). Wearing both now. Was a little worried Dzongkha would “show up” Bachmakov, but no — nice to remember how wonderful Dzonghka is, but Bachmakov is pretty wonderful too. The D. is earthier/darker/warmer, the B. is brisker/brighter. But they do have something sort of vaguely in common. Oh. I think my lemming just ran headlong into a brick wall on its way to the cliff. I must be the only person on earth not to like Dzongkha. At all. Nope Zee, I’m another one. There’s a smokey note in ti that really blows up on my skin to dirty ashtray = not good! Gosh, but I didn’t say they smelled the same. The TDC is not smoky at all. t’s actually not the smoke that bothers me, Rapple; it just goes incredibly sweet and Duchafour-sour at the same time on me. Sometimes iris does that sweet thing on/to me (Antonia’s Flowers has one that acts up too). I know you didn’t say they were the same at all, Robin, but your noticing a similarity was enough to at least give the lemming pause. Which is not a bad thing, I should add. Interesting! Sounds like this one might work better in warmer weather than Dzongkha? Can’t wait to try it! Can’t put words to exactly why, but I’m always routing for Celine. Maybe because she has such large shoes to fit (daddy). Not that he has big feet. This got me thinking – it’s was JCE who did l’Eau d’Hiver, right? Are there any similarities between that one and De Bachmakov? Oh dear, my little mini of Hiver has turned!! I hate that. So am going mostly on memory: Hiver, while sheer, is much sweet/foodier than this, and it’s more overtly floral. And Hiver does feel cold to me, but not “brisk” in the same say that this one does, if that makes sense. Thanks, Robin! That’s a shame about you Hiver mini, always a bummer when that happens. This sounds so interesting! I’ll be wishing for one of the little travel sizes, too. They’re certainly much more affordable. Really? You like this one the best, Robin? Better than Sel de Vetiver, or any of the others? That’s saying a lot. I will have to try this one. I like Sel de Vetiver, but would not say I love it…so no contest there! Robin, very interesting review! crazy snow-concept! I will definitely try it if I get the chance. I know Sel de Vetiver had lots of fans, but yeah, not my sort of thing. Gosh, would have left my comment sooner but I got distracted by the scarecrow…um, sorry, waif-like model. And the bird’s nest on her head. And her tattoo on her arm. Anyway, the “the idea of buds and green stems pushing up through snow” sounds mighty enticing in this heat as does a twist of lemon over iced gin! Perfect review and it sounds delightful. And yes, smaller sizes please! I’m sure that is not a real tattoo…the same design is in the press materials so I’m sure they painted that on. The fashion mags are always doing that to hair, and it always makes me laugh. I would not let anyone do that to my hair for anything. That’s pretty much what my hair looks like when I wake up in the morning. Maybe I should be a model. Well, my hair was like that when I wore it shoulder length…. They ve been trying to “bring big hair back” for some seasons now. Wow! This sounds as something I would adore! I didn’t like a lot the last TDC, Sublime Balkiss and Oriental Lounge (this one smelled like YSL Cinema on me). But I have to try De Bachmakow soon. If I fall in love with it, I’ll wait for a small bottle. Oriental Lounge was interesting but I didn’t fall in love with it either, although Sublime Balkiss did make me smile! This fragrance sounds like a must try – I don’t think I have anything that would be similar to it.. That model skeered me a little, seriously. Buds pushing through the earth during the spring thaw is such an enticing idea alone, but throw in the rest and I’m totally sold. I’m a winter girl anyway, so cool/cold frags always intrigue me. I do so want in on the split action when it happens. This sounds glorious! Wonder if it will smell like winter to you? Do report back. The three Different Company fragrances that I have tried (Osmanthus, Bois d’Iris, and Un Parfum des Sens et Bois) have all been lovely, but fleeting on my skin. I don’t think I got more than an hour out of any of them. Would you say that this one is longer lasting than any of those (assuming you have tried them)? It is certainly longer lived than Osmanthus. I did not remember Bois d’Iris being that short-lived, and admittedly hardly remember the Un Parfum des Sens et Bois at all, much less how it lasted. Anyway, I am trying this dabbed not sprayed, and even then the lasting power is quite good (it even lasts through a shower on me). Ooh this sounds yummy and interesting! I have only begun exploring TDC and am happy they have the line at Barneys. Hopefully this will come in during our autumn-months summer! Yeah, hope we won’t wait ages for it to launch here. It sounds wonderful, can’t wait to try it. The lone dissenter here, I have to say that I’m a little leery. You had me right up until “mildly spicy.” Threw my lemming right off and drop-kicked it. Of course, that’s not saying I wouldn’t try it if I didn’t have the chance. It’s just that I haven’t been crazy about any of the TDC’s– including the one I inexplicably own– so I can’t muster up much excitement. Or maybe this is all because I know I am in dire straits financially and can’t afford to want anything. Send me a message a MUA. Always best when it doesn’t even sound good, right? Your review and description Robin, make this sound much more interesting than just the list of notes would indicate. And high praise indeed from you if it made your ‘Buy’ list! IMHO it *is* more interesting than it sounds…but we’ll see what everyone else thinks, eventually! I enjoy wearing Osmanthus a lot, and it is one of the rare scents that works for me in any season, which is useful. Definitely want to sample this new one! That is useful! I think this one works year-round too, but will have to wait until winter to find out. Love Balkiss–still a strong favorite. But this–cilantro? Blech. Hate the taste, might as well lick the Tide bottle. Cedar amps up on me, and I smell like a hamster cage. So this is a pass for me. Those shadow running by? Other people’s lemmings. Did you try it and hated it, or just saying it doesn’t even sound like something you’d like? Hi! I just received a sample of this one (as well as a few others) and I have to say, it is magnificent. The northern Australian climate doesn’t play so well with anything too floral or herbal, and it’s nice to find another of the select few of these that doesn’t give everyone within a 10m radius a blinding headache as soon as you step out of the air conditioning. So glad you liked it! And yes, I would think it would work in nearly any kind of weather. Wow! Love it! My new favorite. I can’t wait for the 50ml to hit the US. I’m tempted to order the 100ml direct from TDC. However, not exactly thrilled about plunking down that kind of cash. Just got a sample today after seeing it on the best-of list recently. The opening reminds me of Lubin Gin Fizz a little bit, though the Lubin is a bit more gin-y. The craie douce is working for me. It’s kind of like how I imagine iris should smell but never does on me. Iris tends to go soapy on my skin, which I don’t much care for. So I wanted to like Dzonkha more than I actually did. D just kind of smelled like somebody was giving some vetiver roots a bath to me. DB is cold and wintry. I think I’ll really like it for summer.